The Morris Canal was a 107 mile canal across northern New Jersey. In use from 1829 to 1924, it stretched from Phillipsburg on the Delaware River eastward to Jersey City on the Hudson River. It was considered a technological marvel for its water driven inclined planes used to cross the northern New Jersey hills. Completed to Newark in 1831, the canal was extended eastward to Jersey City between 1834 and 1836. The canal carried coal from Pennsylvania to the growing industries of northern New Jersey. By the 1850’s, railroads began to take business from the canal, although in heavy use through the 1860’s. It was leased to the Lehigh Valley Railroad in 1871, taken over by the state of New Jersey in 1922 and formally abandoned in 1924. By 1929, the state had largely abandoned the canal. 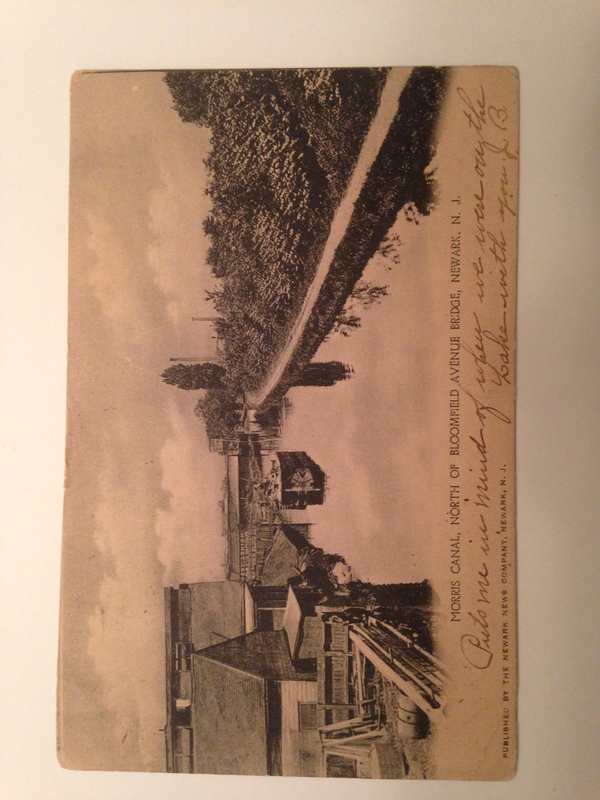 The post card in this blog was advertised as a photo of the canal from 1935. I was puzzled as the canal no longer existed in 1935. I thought that it was a reprint of an older card. As it turned out, the seller misread the date due to an unclear postmark. The card actually dated from 1905 !